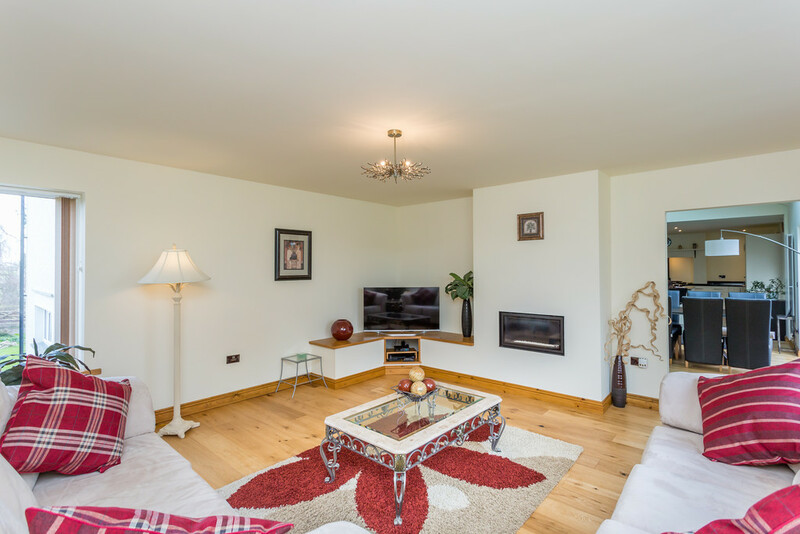 accommodation suited to a range of buyers. 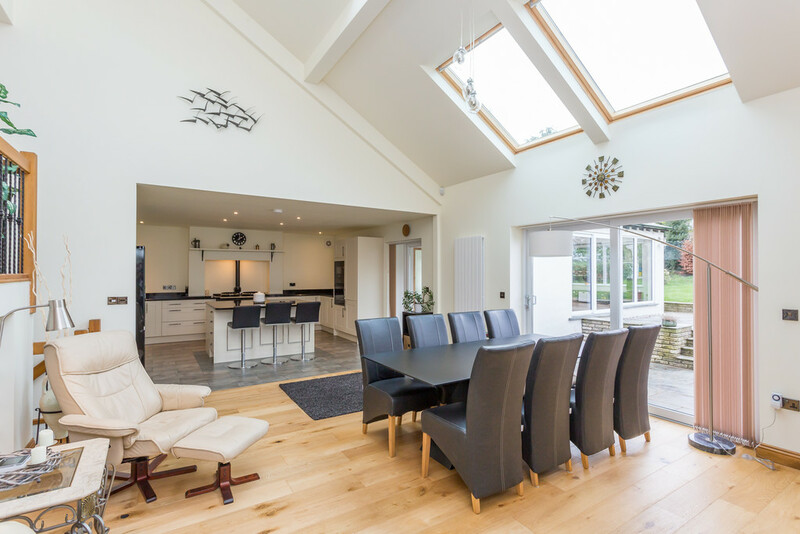 This beautiful home has been thoughtfully designed to create sizable living spaces that are filled with natural light thanks to the expanse of full length and velux windows, high ceilings and quality solid oak floors that add to the calming and relaxed aesthetics. Centred around a show stopping open plan kitchen and dining area with vaulted ceilings, this well equipped home also includes two separate reception rooms, utility, pantry, two bathrooms, four double bedrooms to include the most impressive his and hers master suite with walk in wardrobes and a beautifully finished ensuite shower room. 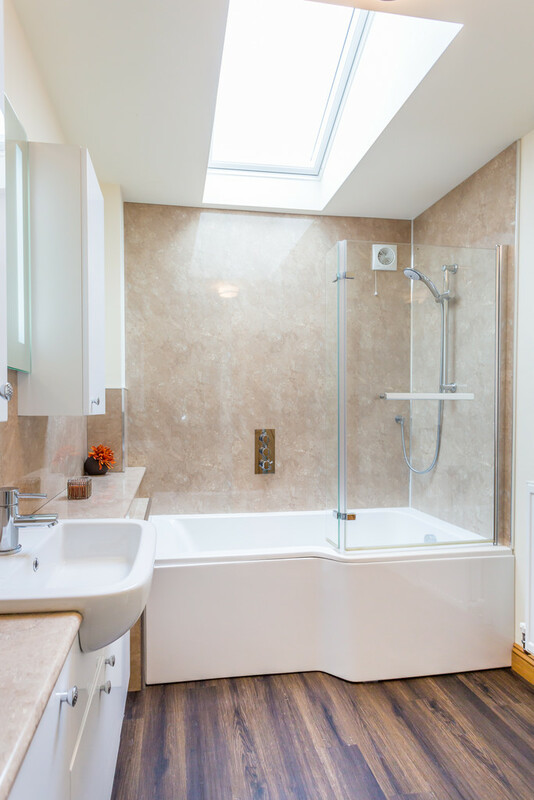 Plans have also been approved to convert the loft space for use of a sizeable fifth bedroom if required. Externally, the surrounding plot offers a mix of manicured lawns and patios that offer something for everyone. 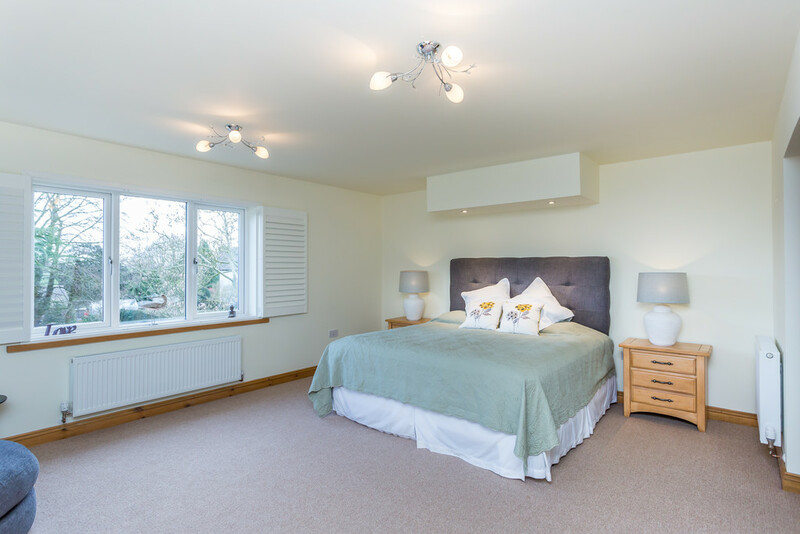 Whether that’s relaxing on the flagged patio enjoying the far reaching views over the rolling countryside, growing vegetables in the green house and harvesting fruit from the trees or making the most of the private driveway and integral double garage. Ackenthwaite is a small and peaceful hamlet located less than mile out of Milnthorpe village. 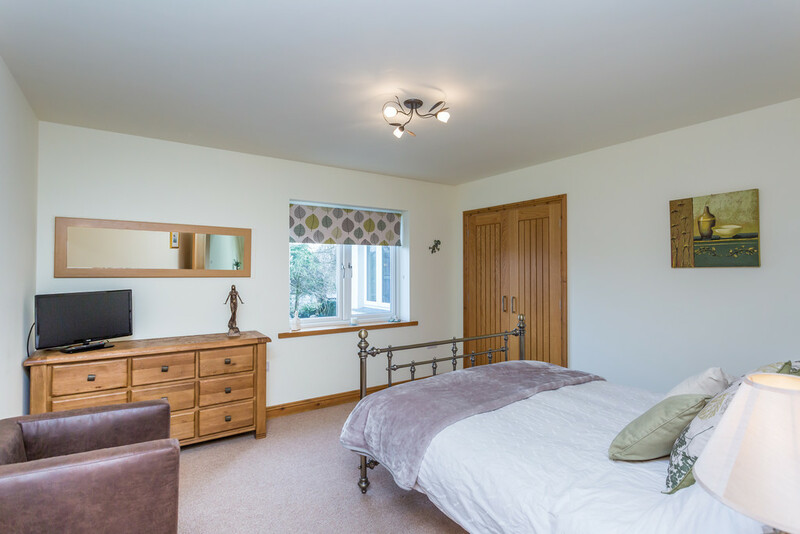 Offering the countryside ideal whilst not compromising on convenience, commuters will be delighted to find M6 access approximately 3 miles and the Oxenholme train station 7 miles away. Milnthorpe offers a wealth of amenities including shops, cafes, restaurants, doctors, supermarket and well regarded schools for all ages. 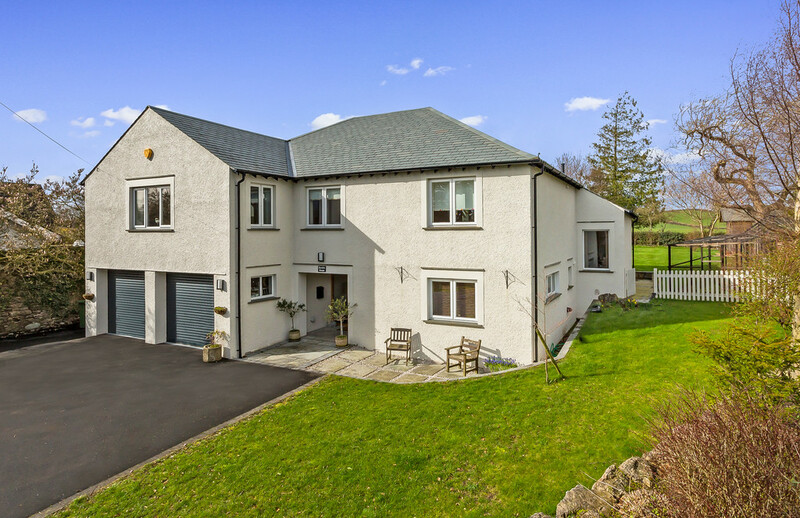 Discerning purchasers will also find themselves just 9 miles away from Kendal town and the foot of the Lake District National Park. Newly awarded a UNESCO world heritage site, the Lake District attracts millions of visitors from across the world every year and offers a wealth of stunning scenery, walks, activities and picturesque towns and villages to explore. 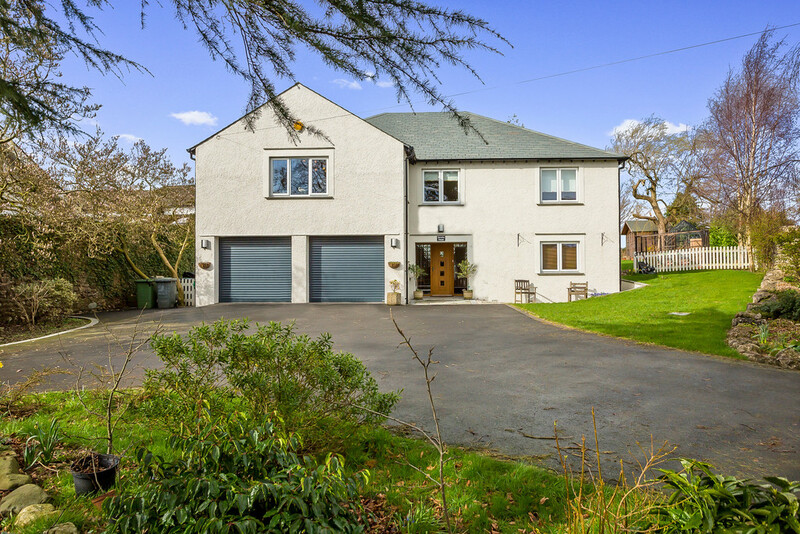 The private drive opens out onto a large tarmacked parking area at the front of the property, affording access to the two remote control operated doors of the integral double garage. The driveway is surrounded by tall trees and garden and is fully enclosed to create a private haven and natural setting. The entrance door leads through a covered portico into the lower ground of the split level living accommodation. 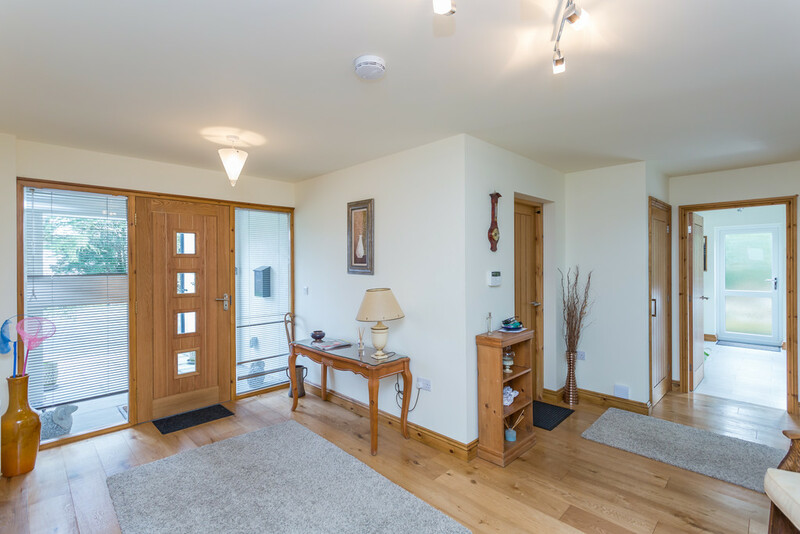 The entrance hall is spacious and welcoming with an eye catching glass wall feature and solid oak floors that run throughout the reception areas. Practically there is a double cloaks cupboard, a built in storage cupboard, utility room with plumbing for washing machine and dryer, access to the integral double garage and a modern shower room and generously proportioned double bedroom/home office, perfectly located as it is set away from the main accommodation. Oak steps lead up to the deceptive main living areas of Derefin House. 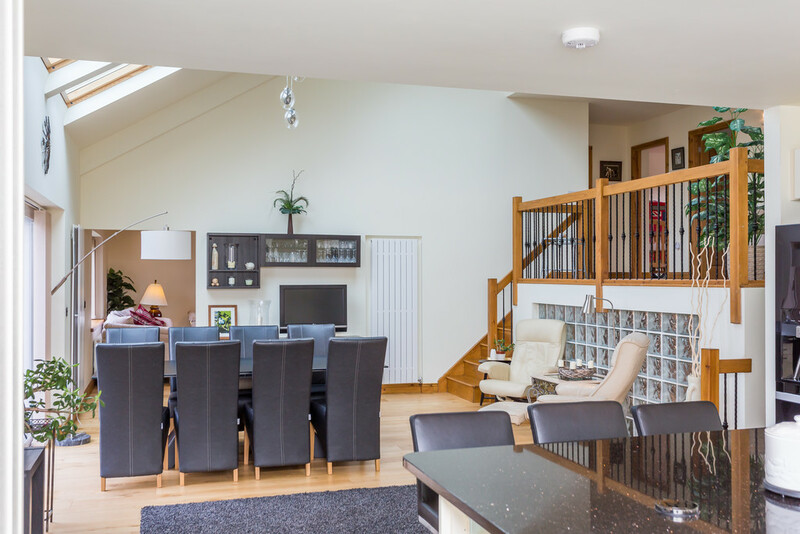 Leading directly into the open plan kitchen and dining area you are immediately greeted by the natural light that flows throughout thanks to the high vaulted ceilings, large electrically operated velux windows and full length patio doors that overlook the rear garden and countryside beyond. 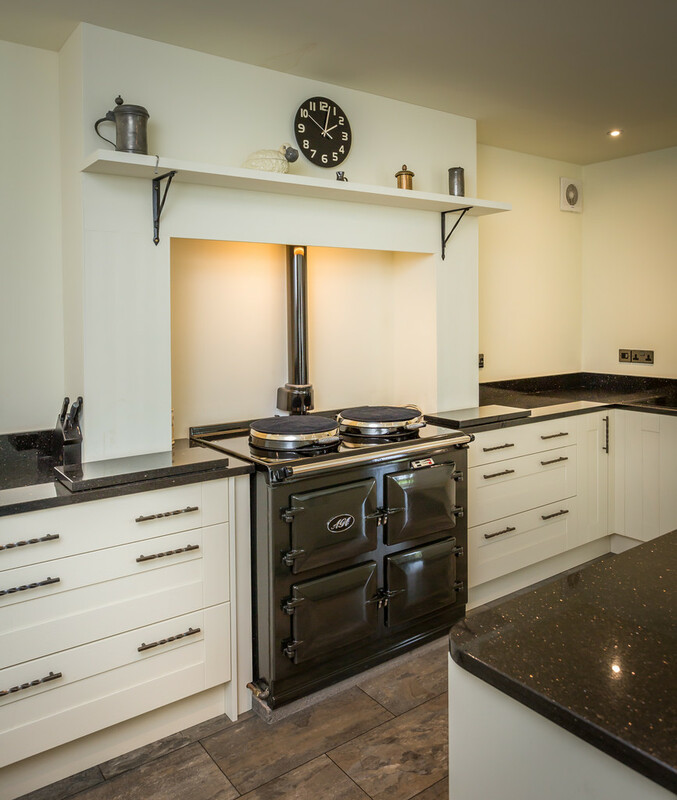 The well equipped and tastefully designed kitchen includes a range of painted wooden units topped with granite work surfaces that encompass a selection of quality appliances to include a 4 ring induction hob, Bosch oven and microwave, integrated dishwasher, American fridge freezer and a 3 door gas fired AGA set within an inglenook. 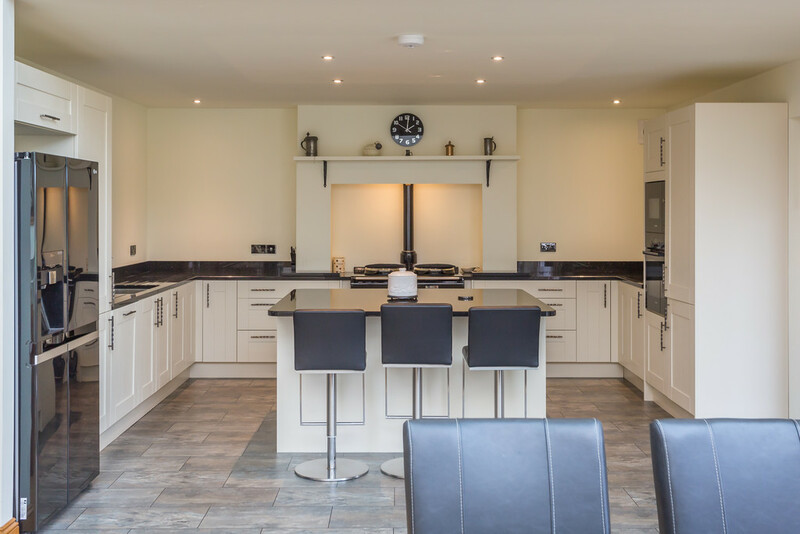 Designed with entertaining and modern family life in mind, there is a large central island and breakfast bar for a more informal setting whilst the adjoining dining room is the perfect space for hosting dinner parties. The vaulted ceilings extend up to the mezzanine gallery landing of the first floor, with exposed wooden ceiling beams giving charm and character to an otherwise contemporary home. Adjoining the kitchen, there are two separate reception rooms. 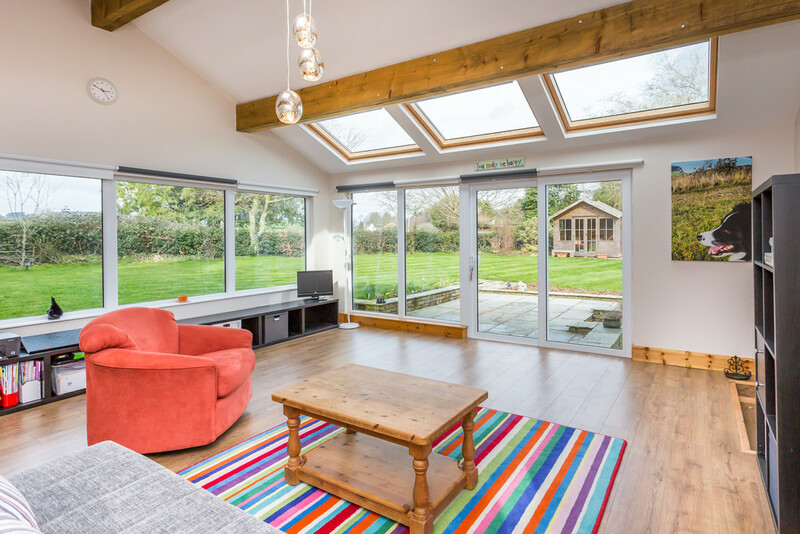 The garden room is a bright and airy space boasting tall vaulted ceilings, exposed ceilings beams and larger than average velux windows. 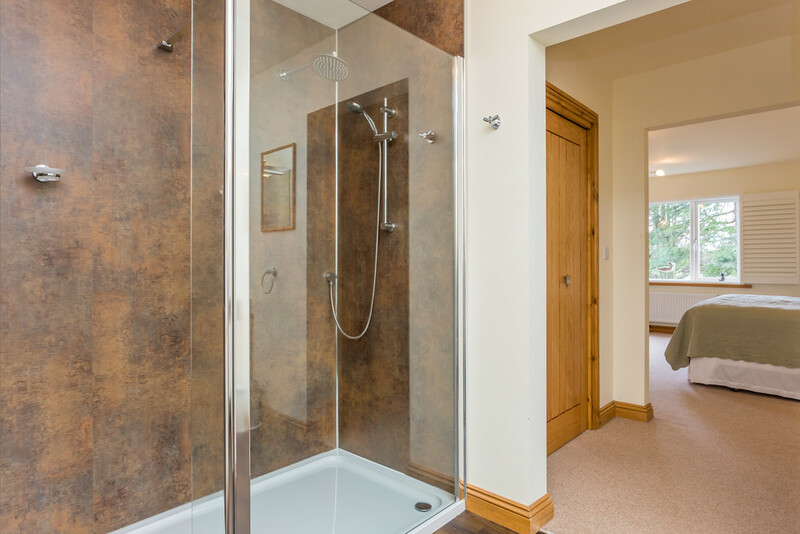 This could also be utilised as a studio or further developed into an annexe along with the pantry. if required. The expanse of windows offer a dual aspect over the garden with access onto the patio, perfect for opening up during the summer months. 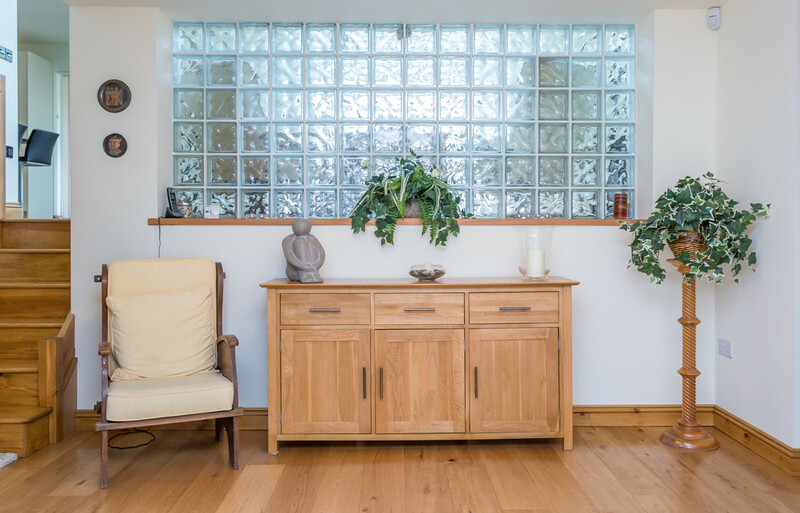 For the winter, the feature log burner with exposed flue is fantastic for creating a cosy atmosphere but for a more intimate setting, there is also the sitting room. 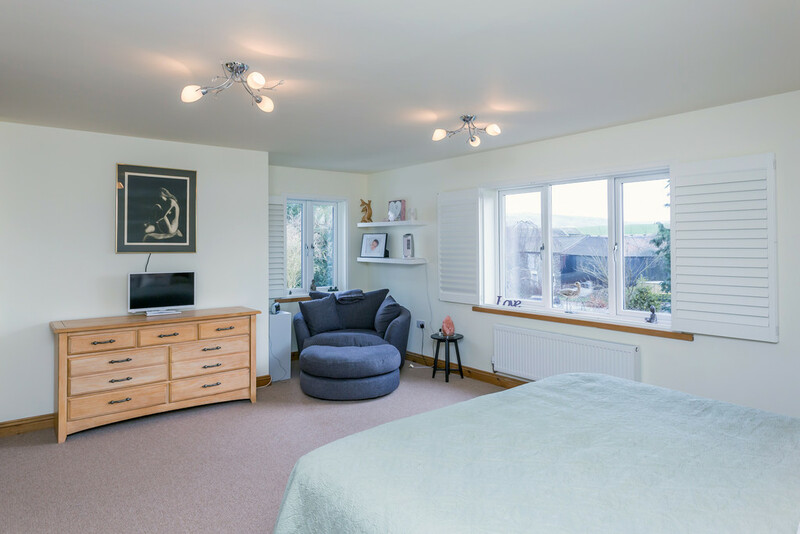 Accessed from the dining area, this is still a sizeable reception room with views over the front and rear and a feature built in, contemporary gas fire. 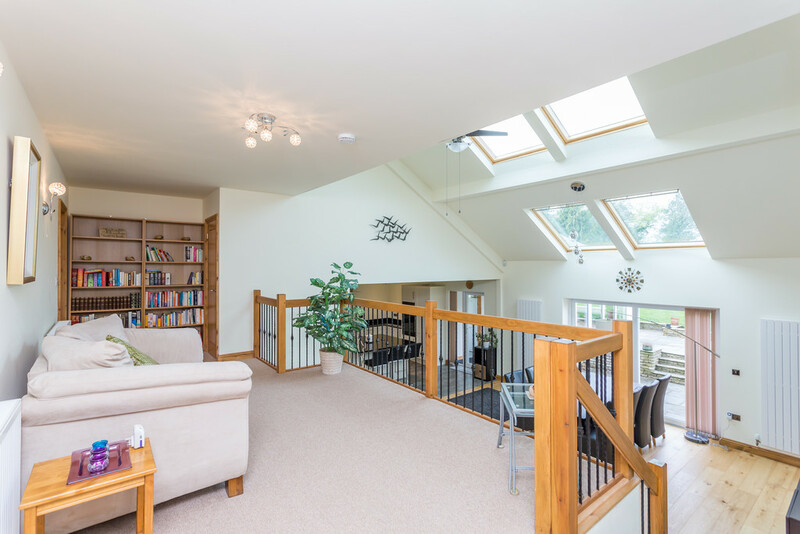 The oak staircase leads up to the large mezzanine gallery landing of the first floor, which affords space for occasional furniture and built in bookcases, a great space for curling up with a book and enjoying the garden views. 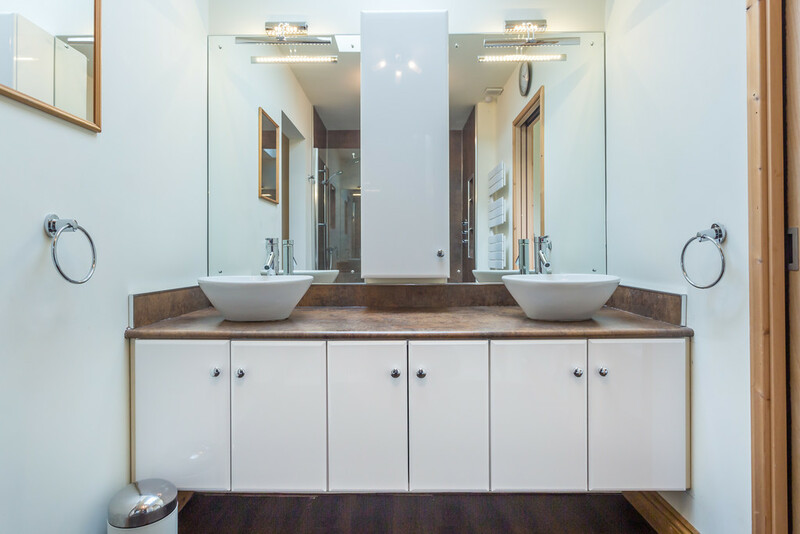 The generous master bedroom inlcludes built in storage cupboards however most impressive is the adjoining his and hers walk in wardrobes and the beautifully finished ensuite bathroom featuring his and hers sinks, a large walk in rain shower and separate WC. 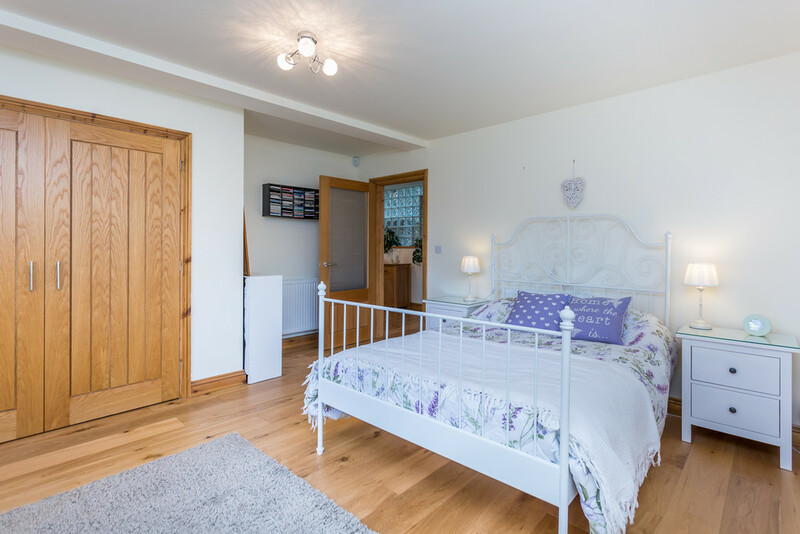 The remaining two double bedrooms are also of good proportions and there is a tasteful family bathroom, double linen cupboard and an airing cupboard with access to a loft space. Plans have also been approved for a loft conversion that would provide a fifth bedroom. 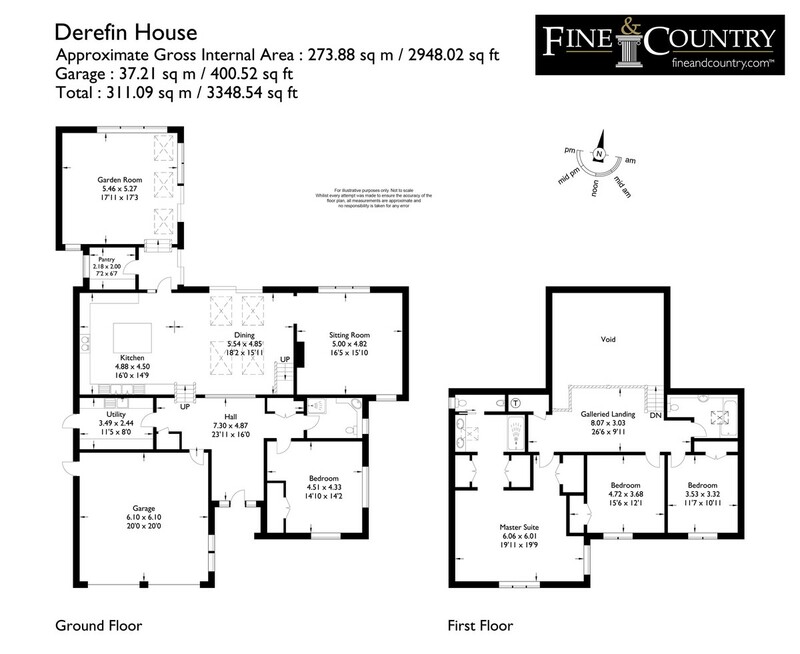 Derefin House boasts a generous plot size, perfect for the larger of families. 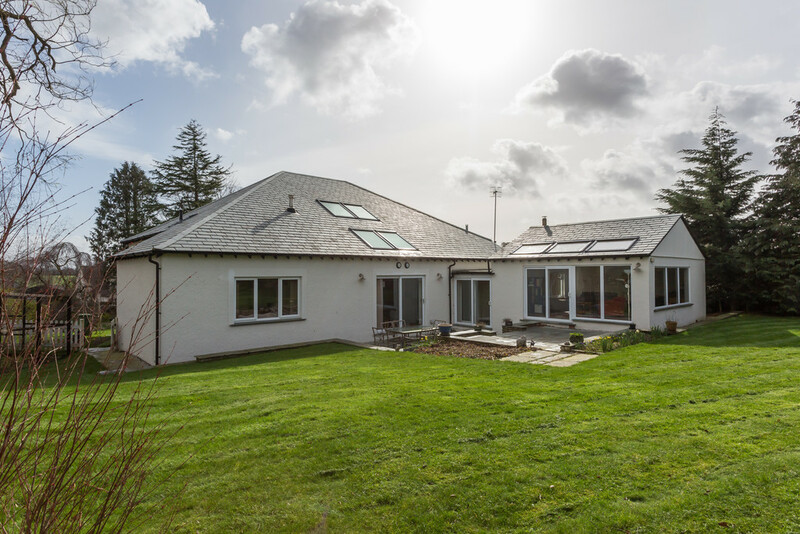 To the front, there is a large tarmac driveway with ample parking and access into the remote controlled double garage. 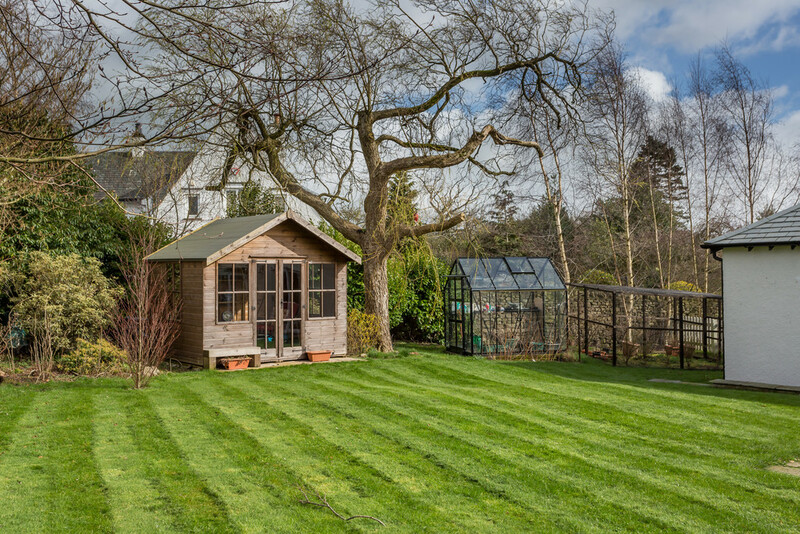 Lawns, natural rockery borders, tall trees and an array of shrubs create a natural and private setting and there are even a selection of fruit trees to include plums and apples. 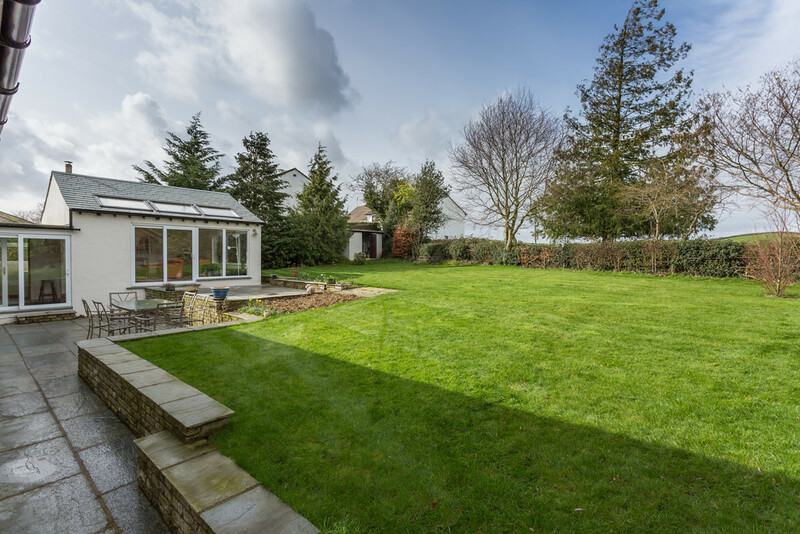 The gardens lead around the property to the landscaped rear garden. 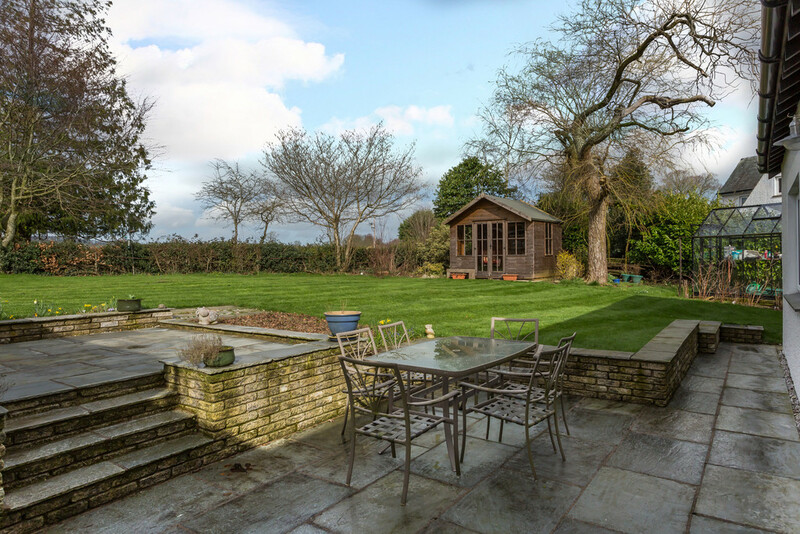 The summer house looks out over the manicured lawn which is flanked by local countryside. 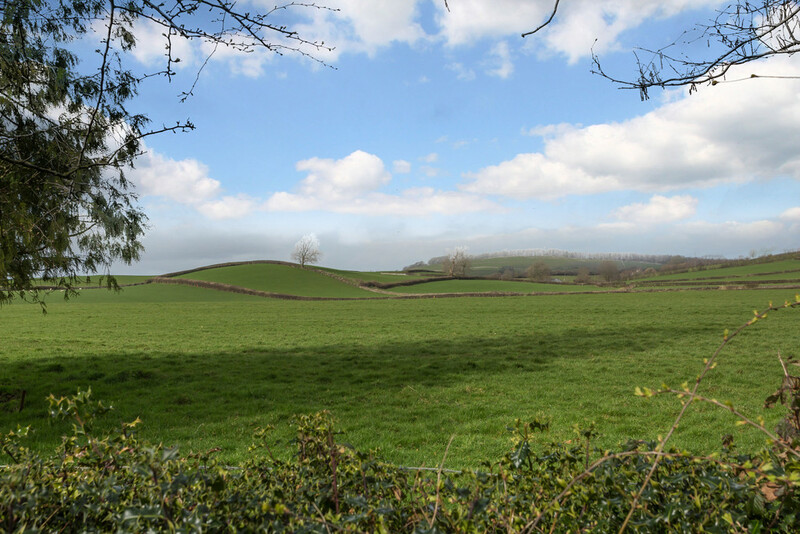 These lovely views can be enjoyed from the flagged patio, accessed from both the dining and garden room, this is a great area for alfresco dining and barbecuing. The keen gardeners will be delighted with the green house and fruit cage and there is also a useful garden and log store. From Milnthorpe, entering the village from the B5282 crossroads, continue for approximately ½ a mile. Continue straight at the roundabout at Dallam School, after approximately 0.2 miles the driveway to Derefin House is on your left hand side.